Bolsonaro was visiting Israel just days before Prime Minister Benjamin Netanyahu faces general elections. Prior to the trip, the Brazilian leader went back his promise to transfer his country’s embassy from Tel Aviv to Jerusalem, saying that his government may instead open a “business office” in Jerusalem. 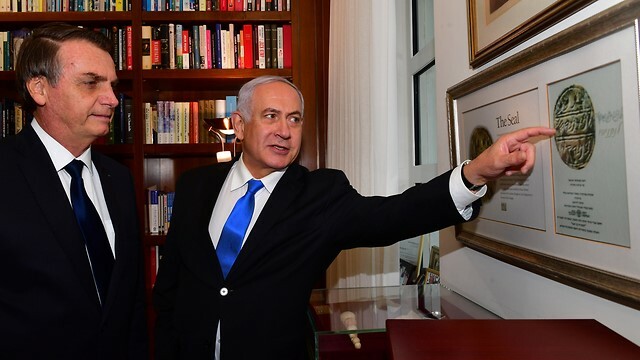 Netanyahu has appeared eager to embrace the new leader of Latin America’s largest economy, despite criticism by Bolsonaro’s opponents at home that the president is hostile to black, indigenous, Communists and LGBTQ people, as well as the environment and human rights. Several demonstrations were held during the Bolsonaro visit to Israel. On the first day, Sunday, March 31, hundreds, among them members of Hadash and Communist Party of Israel, human rights activists, member of the Brazilian community in Israel and LGBTQ people protested near the PM’s residence on Balfour Street in Jerusalem during the meeting between Bolsonaro and Netanyahu. Other protests were held at Ben Gurion Airport, near Bolsonaro’s hotel in Jerusalem and outside Yad Vashem.